You’ve decided on the right breast pump for you and now you need to know how to care for it. To get the most out of your pump you must know how to keep it in top condition! The most common question a lot of new moms ask is how to clean your Breast Pump, the pump parts and bottles. Follow these steps to clean your Breast Pump correctly. If you are renting a hospital-grade breast pump, it is mandatory to purchase a personal-use Symphony double-pumping kit to use the pump. The personal-use kit is made of BPA-free plastic and is new for you to use. Before using your kit for the first time, clean and sterilize all kit parts that will touch your breast and milk, such as: breast shields, breast shield connectors, white membranes, yellow valves, breast milk bottles and lids. It is important when using personal-use Medela breast pumps to remember it is not recommended to share these pumps or to purchase them second-hand due to hygiene reasons – even if you purchase your own new personal-use pumping kit. The only Medela breast pump currently recommended for multi-user use is the hospital-grade Symphony breast pump. This is because it has a closed motor system and can be cleaned fully between users. Please see https://www.medelabreastfeedingus.com/article/12/pre-owned-breast-pumps for more information. There are many methods to sterilize your pump parts. Medela recommends boiling or steaming your kit to ensure full sterilization in an efficient amount of time. The pumping kit must be sterilized fully once every 24 hours. Place parts on a clean surface and/or towel. Allow your pump parts to air dry. Ensure parts are dry before storing them and do not store damp parts to avoid bacteria or mold growth on them. You can sterilize your breast shields, breast shield connectors, white membranes, yellow valves, breast milk bottles and lids by steaming in Medela’s Quick Clean™ Micro-Steam™ bag that comes in your Symphony personal-use double pumping kit pack. Medela’s Quick Clean™ Micro-Steam™ bags can be used 20 times before discarding. To clean your kit parts between pumping sessions ensure you have warm clean water (suitable for drinking), dish soap and a bottle brush specifically designed for cleaning bottles and parts. A bottle brush will help you reach the small parts of your kit to ensure they are clean of milk – preventing bacteria build up. Clean breast pump kit parts after each time you use them or if they become dirty between uses. 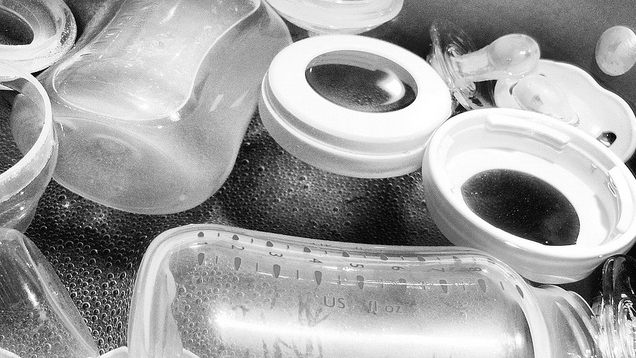 Clean your kit parts immediately after use to avoid breastmilk residue build up on them. Rinse all of your kit parts that came in contact with your breast and breast milk under cool, clean water in order to remove breast milk residue. Washing options: Wash in sink or dishwasher. Soak all separated parts in warm soapy water for 5 minutes. Clean with a clean dish-cloth or soft brush. Allow all parts to air dry in a clean area such as on clean kitchen towel or on a clean rack. 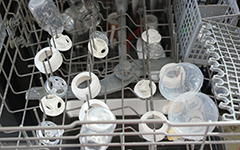 Allow all breast pump parts to air dry in a clean area such as on clean kitchen towel or on a clean rack. *Please note the white membranes are very delicate and may be misplaced in your dishwasher. Similar to when you sterilize your kit parts, store dry parts when not in use. Ensure parts are dry, do not store damp parts. If your breast shields are still damp and you need to pump again, you may use a clean towel to dry excess moisture off of them to ensure good suction to express your milk. The suction tubing should not come in to contact with your breast or milk and therefore does not require sterilizing. If the outside of the tubing becomes soiled you may clean it with a damp cloth, however do not submerge the tubing in water. This blog post has been written using information available from Medela US website. Please see http://www.medelabreastfeedingus.com/products/223/symphony-breastpump/faqs for more information.